This post elaborates how to use passwordless authentication using mysql_config_editor with MySQL 5.6. The mysql_config_editor utility is available for production use as of MySQL 5.6.6 [Technically 5.6.10 since its first cut GA of MySQL 5.6 server]. This utility enables you to store authentication credentials in an encrypted login file named .mylogin.cnf. Running this utility creates a file named .mylogin.cnf file in %APPDATA%\MySQL directory on Windows and the current user’s home directory on non-Windows systems such as Redhat EL6/CentOS/Fedora/Ubuntu. The file is read later by MySQL client programs to obtain authentication credentials for connecting to MySQL Server.mysql_config_editor encrypts .mylogin.cnf unlike its predecessor .my.cnf file so it cannot be read as clear text and supposedly contents after decrypted are only used in memory. If you have access to the system where you have stored these passwords then you can print them, except password is not visible. 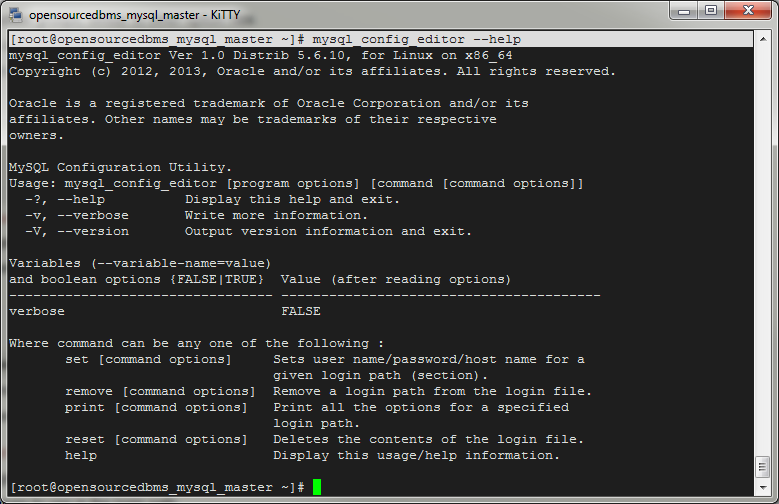 program_options: Consists of general mysql_config_editor options. command: command indicates what action to perform on the .mylogin.cnf login file. There are three commands currently which are – set writes a login path to the file, remove removes a login path, and print displays login path contents. Any options given provide information to the command, such as the login path name and the values to use in the login path. Think login path as connection profile. I divided the rest of this post into three sections for understanding it easily. First part we will set, second part we will print and in third part we will remove profiles. You have now successfully got authenticated with .mylogin.cnf file without a password prompt. You can add more profile/login-paths as desired. Notice that host variable is removed from testbed1 profile. That’s it folks, as simple as that. If you have questions/suggestions hit them up in comments below. Clean and detailed article. Worked like a charm on RHEL. Thanks for the write up. In fresh insatllation of mysql(5.6) is there already mysql_config_editor set with root user and password or we have to set it?